Currently the apache is synonym-ed to apache-2.2. While perhaps useful in the past, it has since lost its usefulness. As apache-2.4 exists now, and the general apache tag is misleading to those who don't immediately specify their version. Remove the apache tag synonym, and ban it (is this possible?). Remove the synonym and create the tag, with a descriptor of what apache is, referencing the other two tags. 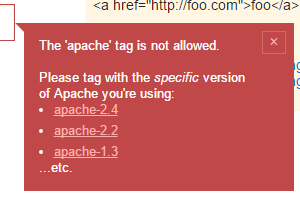 Along with this comes the requirement that a version-specific tag exists for each Apache version being asked about. In practice, this isn't likely to be too different from what was already occurring (since the raw apache tag was being silently renamed to apache-2.2), but be aware that some amount of confusion or mistagging may result - so be prepared to retag (and create new tags) as needed. The apache tag should be blacklisted. Apache 2.2 and 2.4 (and there are still a few freaks out there using 1.3!) are sufficiently different that people usually need to specify the version they are using. I think that it would be handy to have a generic apache-2.x tag for answers which are not specific to a particular subversion of apache. I just had one of those a few minutes ago. What about other Apache things like Solr, Tomcat, or even the Apache Foundation? How is having Apache linked to the Apache 2.2 web server helpful?